Gamecock Girl: Football is over. Now what?? In my mind, there are always a few days in each calendar year that I know will be met with a tinge of disappointment. July 5, November 1, December 26. I think you know what I’m talking about. Those are the ‘days after’ fun holidays with fun parties. Fireworks, costumes, presents- so much to look plan for and look forward to. But since all good things must come to an end the day after all the fun must come too. I always feel that way after the final football game of the season. Seems like I spend so much time planning tailgates, traveling to games, and reading any piece of information I can find about what the Gamecocks are up to that the day after the bowl was always a little sad for me…until recently. Ladies, I’ve got news for you. The fun is just beginning. Here are some of the ways I’ve discovered to make the time between football seasons seem shorter and shorter each year. Stop me if you’ve heard this one…It’s shocking. There are other sports besides college football. Men's and Women’s basketball has quietly been played since November, and I’ve got news for you- we Gamecocks have a lot to cheer about. Dawn Staley has the Lady Gamecocks racing up the national rankings with some really exciting performances, and the men’s games are televised for the rest of the season. If you haven’t had a chance to see any games yet, the slate of SEC games is kicking off next week for both teams. I sincerely believe Frank Martin is going to do for Basketball what Steve Spurrier has done for Football- turn our program into a respected contender. And then there’s Baseball! You would have to have lived under a rock the last few years to not know something about South Carolina Gamecock Baseball, and the season is about to begin. Can Coach Holbrook lead the team to another College World Series? Our preseason ranking is #7 in the nation and there are sure to be plenty of things to cheer about as the Gamecocks lead us into summer. When the press conference announcing Steve Spurrier as the new head football coach at South Carolina concluded, I was engaged in a conversation with a friend about how exciting the announcement was for recruiting. I’d never really followed it all that closely. I was more of the type of fan who read player information in the programs once they were already at USC and followed them as they played through their seasons of eligibility. Well- it’s a whole new world out there, ladies. This isn’t your father’s college football recruiting scenario. While recruiting is literally a year-round situation for college football teams and coaches, the time period immediately before signing day is when things really start to get interesting. The 2013 Class currently has 19 commitments and is ranked the 17th best class in the country according to Rivals.com. There are several targets for this class still “on the board”, meaning they have yet to make a final decision. These are the future stars we’ll be cheering for over the next few years at Williams-Brice stadium, so pay attention. Signing Day is Wednesday, February 6. It’s the literal Super Bowl of college football recruiting. There will be some ups, some downs, and maybe even a few surprises that day. You can follow news and recruiting information on several pay sites like www.Gamecockcentral.com or www.thebigspur.com if you’re interested. There is also www.USCsports.com, which carries free information on players once they have signed their National Letters of Intent. Want to really be “in the know?” Mark your calendar for Signing Day and pay attention to the future of our team. You might just find you enjoy it! For me, spring football means one thing. 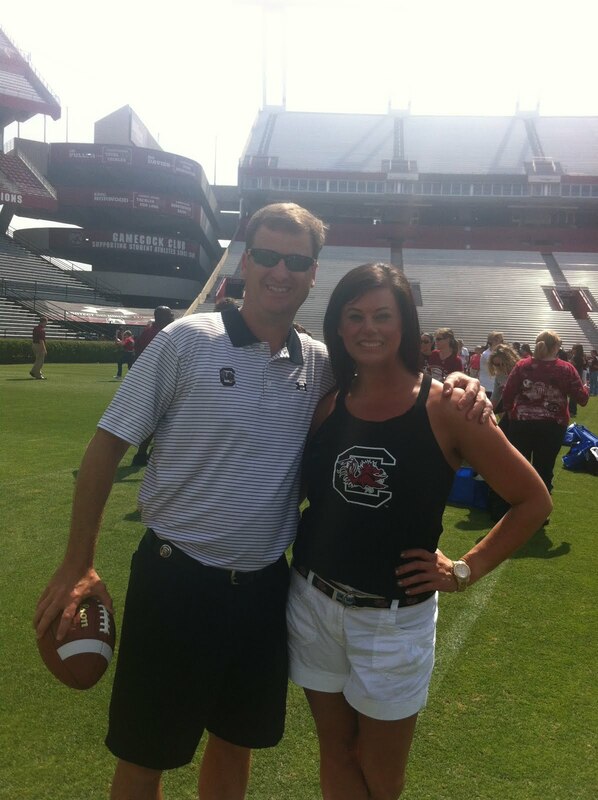 It’s time for the annual Steve Spurrier Ladies’ Clinic. But before we get there, let me give you a 10 second primer on Spring Football. It’s a special time for the team because there are 2 weeks of practice that introduce our new players to the system. Winter conditioning workouts are completed and this is a chance for players to make impressions on the coaching staff about their improvement that will carry into fall camp later that year. The Spring Football season ends with the Spring Game (a scrimmage) at Williams-Brice Stadium. All that is fun (not to mention very important), but for me the best part of Spring Football is the weekend after the Spring Game when it’s Ladies’ Day at Williams-Brice. Gamecock girls, you won’t want to miss this. The morning begins with your chance to meet and talk with coaches and even some players. You tour the locker rooms and training facilities. You can have your picture made Coach Spurrier and the trophies from the previous season. (This year the Hardees trophy and Outback bowl trophies will be on display.) There are short sessions with each of the coaches where you learn some X's and O's about football. After lunch, you observe training/exercise sessions with the players down in the weight room and go to film room for highlights. The day ends on the field where everyone gets to run out of the tunnel to 2001 through the fog. Once on the field everyone gets to catch a touchdown pass from one of the coaches. It’s a great day to meet other ladies and learn a little something along the way. It’s one of my favorite days of the year! The date for this year’s clinic has not been announced yet, but stay tuned. We will be sure to pass that information along to you. Today is January 3. Kickoff for the 2013 football season is exactly 240 days away. College Recruiting is in full swing right now for football. February 6 will be here in no time. Spring football kicks off around Easter, and the slate of Basketball and Baseball games on the schedule will carry us through the week of July 4 (assuming we go all the way again in Omaha). If you time your beach trip to keep you busy some time in July, by the time early August rolls around fall camp begins, and the season is just a month away. Believe me- time flies when you’re having fun, and I hope you enjoy some of these ideas for ways to make these next 240 days a little bit more fun. Stay Cocky, ladies!